In Tap Tap Monsters you can be the engine of evolution for fantastic monsters. By combining two identical monsters, you get a new, more advanced creature, thus passing the path from the simplest magic and astral creatures to magnificent giant dragons.Before you is the opportunity to choose the evolutionary path: fire or water, nature or chaos – everything is in your hands. A completely populated world is not the end, because in the game you can discover many new worlds, populate them with monsters and test out other means of evolution!There are 8 biome-worlds in the game that are built according to the origin of the universe and the elements:▪ ENERGYIt personifies the primeval magical energy of the universe, from which all beings originate! The creatures here are magical and astral, like Sunny Dragon and Magical Slug.▪ STORMIt is a world inhabited by creatures personifying natural cataclysms: Thunderhorn, Electroray, Dark Cloud and more!▪ FIREA very hot biome, where only the most stalwart monsters live, such as Fiery Giant and Hothead!▪ WATER An unexplored biome, where various oceanic bacteria like Octobrain and Sea Star develop!▪ CHAOSThe gloomy world, here unexpected creatures evolve like Darktail and Wanderer!▪ METALA robot biome, where there’s no place for the living! iBot, Roboboy, Smarty and a host of other cyborgs live here!▪ ICEA chilling world in which ancient creatures originate! There you will be met by the Snowy Snake and Ice Cube in the company of the Snow Yeti!▪ NATUREThe most lively and flourishing biome of all! This is where the unpredictable elements of development live, for example, the beautiful Lily or the impenetrable Stone!There are also 4 secret biomes:▪ DEATH▪ STEEL▪ CRYSTAL▪ LIFEStudy each biome separately to discover them!The game begins with the first monster in the “ENERGY” biome. By combining two identical monsters, you create a new monster. By combining the last two monsters from the biome, you receive access to a new, previously unexplored, biome! 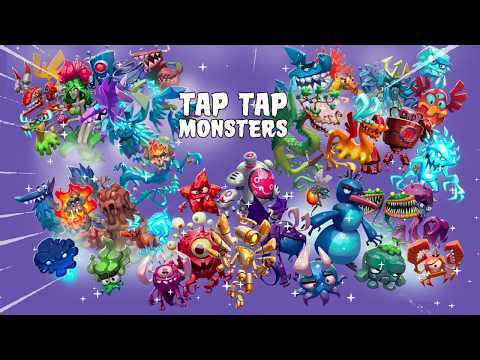 Study all the worlds in Tap Tap Monsters!Thanks to this scientific and educational clicker, you can go through all the stages, mixing different cells; from minute bacteria to monsters!Go through the game several times and learn the different stages of the universe!Start creating your world right now!